The craft beverage category is growing at a phenomenal pace. The resulting plethora of craft beverage packaging is a delight for libations lovers and design lovers alike, offering a feast for the eyes as well as for the palate. However, as shelves become ever more crowded, and producers vie for attention, the importance of a thoughtful, strategic approach to brand development cannot be overstated. An eye-catching package is central to gaining consumer attention for your brand, of course, but the power of the package to grab the attention of gatekeepers is too often overlooked. Your package, product concept and brand story must all work together to help you obtain distribution and a coveted spot on the shelves of retailers and bars. Craft beverage producers are invited to join me and a unique panel for a free 60 minute webinar at 1 p.m. PST on Tuesday, January 19th, titled “Gaining Attention in a Crowded Marketplace – Fundamental Branding Strategies for Craft Beverages.” The webinar will focus on branding tactics to get your product noticed, and will feature panelists H. Joseph Ehrmann, Proprietor of Elixir saloon and Cocktail Ambassadors consultancy in San Francisco, and Scott Evans, VP of Marketing at wine and spirits distributor, The Henry Wine Group. • What works at retail and at the bar – are they the same or different? Subscribe to receive branding insights and new work. We promise not to overload your inbox, and we won’t share your contact info, ever. Receive quarterly branding insights and new work. When I heard Cynthia speak at a conference, I was immediately taken by her clear understanding of how effective packaging can sell a brand. Soon after, we began working with Sterling Creativeworks and throughout the entire process, we felt completely understood and supported. SCW was able to effectively formulate our vision into a brand essence and story, then move full force into the logo development, packaging, and branding items. Throughout the process, SCW set up a well-organized meeting schedule and always followed-up. They were most professional on all counts and we were extremely lucky to have been able to work with them. It’s always great to work with Sterling Creativeworks who brings both innovative thinking and the stories of our brands to life through their creativity and execution. "When our 50th anniversary presented a timely opportunity to update our legacy wine label, there were levels of both concern and excitement at ZD. Cynthia and her team proved to be the complete package. They produced an elegant label that improved upon the preexisting core elements while catering to multiple passionate decision makers that can often be found in a family business." “Sterling Creativeworks is a pleasure to work with on all levels and at every stage, going above and beyond to provide high quality results along with a fulfilling partnership experience. Knowledgeable and talented, Cynthia and her team give thoughtful guidance, bring detailed project focus and incredible drive to every project." “I've been working with Sterling Creativeworks since I started at Constellation Brands two years ago. We've built a very strong professional relationship that I appreciate. Her team's work is brilliant, but the collaborative roll-up-our-sleeves spirit and enthusiasm for each new project has made our great partnership an irreplaceable one." “I have worked with Cynthia and her team for several years now, at different companies and on many different projects. I have found Cynthia to not only be an excellent designer and project manager, but a trusted strategic partner. Cynthia has been instrumental to the launch of our business GrapeSeed, where we have launched six wine brands with less than eight months of total development time. We would not be where we are today without Cynthia and Sterling Creativeworks." "The marketing department at Cork Supply has been working with Sterling Creativeworks over the past year. We enjoy working with them for a multitude of reasons. First and foremost, they are extremely professional, cost effective and ultra-efficient. They always fully understand our needs and bring our visions to life. The materials they have created for us have been nothing short of genius. Sterling Creativeworks have been an absolute pleasure to work with and I look forward to our continued partnership. I would highly recommend them to any company looking to take their marketing materials to the next level." “Working with Sterling Creativeworks is always a very collaborative process and one in which a broad range of creative designs are explored. Not only did the final design exceed our expectations, but it helped us better communicate our unique branding and positioning to the trade and consumers. It reinforced our key selling points and created an ownable look for us on the shelf." Copyright © 2018 Sterling Creativeworks. All rights reserved. Enter your name and email to receive your link to view the replay of the Gaining Attention in a Crowded Marketplace Webinar. We respect your privacy and won’t share your email. 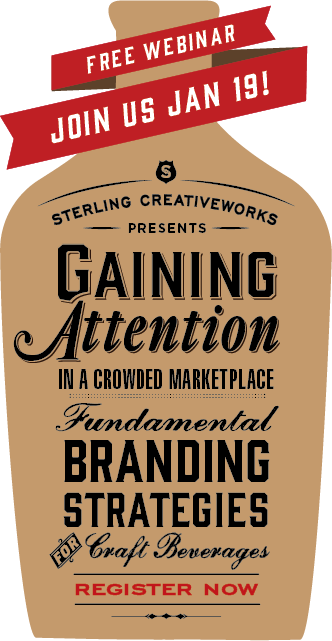 Please check your inbox for a link to view the replay of the Gaining Attention in a Crowded Marketplace Webinar.